Tämä itsepalvelu lomamökki on palautettu 19th century maalaistalo seisoo kukkulalla houkutteleva laaksoon. Se on aurinkoinen etelään sisäpihalle tukena kaksi suurta latoja ja 1. 5 hehtaarin tontti kuuluu puutarha-alueet erilaisia ​​hedelmäpuita kuten omena, luumu, viikuna, Damson, mirabelleluumu-, kvitteni ja pähkinä. Alla pieni niitty on suuri 12m x 6m aidattu uima-allas, jossa on itsesulkeutuva portti. Talo on tilava ja mukava, erittäin suuri perhe keittiö, ja on runsaasti säädetään kaikin tavoin (vuodevaatteet, keittiökoneet ja astiat, TV, musiikkisoittimet, pelejä, WiFi jne .. Tavoitteena on varmistaa, että vieraamme ovat kaiken tarvitsemansa, että kaikki talossa toimii kunnolla ja on laadukasta. Jos pidät rauhallisella maaseudulla, hyvää ruokaa ja viiniä ja vilkas Ranskan markkinoilla, aloita tästä! Angouleme, Brantome, Cognac, Perigeux ja kaikki suuret viininviljelyalat noin Bordeaux (joista St Emilion on luultavasti houkuttelevin) on helppo päästä autolla. Atlantin rannikolla on alle 2 tunnin ajomatkan päässä; ja luolat Dordogne ovat noin tunnin ja puoli pois -a ihmeellinen matka pahan päivän varalle. Myös helpon matkan päässä on runsaasti tenniskenttiä, ja jokien ja järvien uida tai kalastaa tai vene. Golf: On 9 reiän golfkenttä houkutteleva vapaa-ajankeskus noin 15 minuutin päässä, jolla on myös tenniskenttiä ja uima-allas. Perigueux (40 minuuttia) ja Cognac (50 minuuttia) on myös erittäin hyvä 18-reikäistä kenttää. Idyllic family retreat in the heart of rural France. There are not enough stars to rate this wonderful holiday home - it's that good! From the moment we booked La Cotte we knew we were going to be looked after as the owner phoned us immediately to make sure we were happy with what we were getting. There were ten of us altogether (outnumbered with four adults to six children ranging from 8 to 14). Frequent detailed emails then followed leading up to our stay where our questions were answered and suggestions made about places to visit etc. The house itself is a delightful converted barn fitted out with all you could need. The pool kept the children amused for hours, while the pingpong barn was just perfect for late-night games over a cold beer. We were lucky with the weather in that it generally stayed around the mid to late 20s, with the odd day hitting 30, and many hours were spent sipping cold drinks (and the odd filter coffee) underneath the walnut and apple trees by the pool with a good book. Dining was generally al fresco, when we were often entertained by the odd scurrying lizard and darting redstart. The redstart, in particular, serenaded us with wonderful songs, while hummingbird hawkmoths hovered over the many brightly flowered plant pots. In fact, if you like your wildlife, you won't get much better than La Cotte. Butterflies flutter around all over the place - especially on the white-flowering mallow bush - and we even saw black kites drift overhead from time to time - and a hoopoe foraging for ants in the garden! The charm of neighbouring villages, seemingly not changed for years, makes this part of the world even more enticing. Brantome (where the whole gang went kayaking on the river Dronne) needs a special mention and is only 35 minutes or so away, while Chateau de Hautefort is just incredible if you like your real-life fairy princess castles. Overall, La Cotte is amazing, the area is outstanding, and the owner is first class. 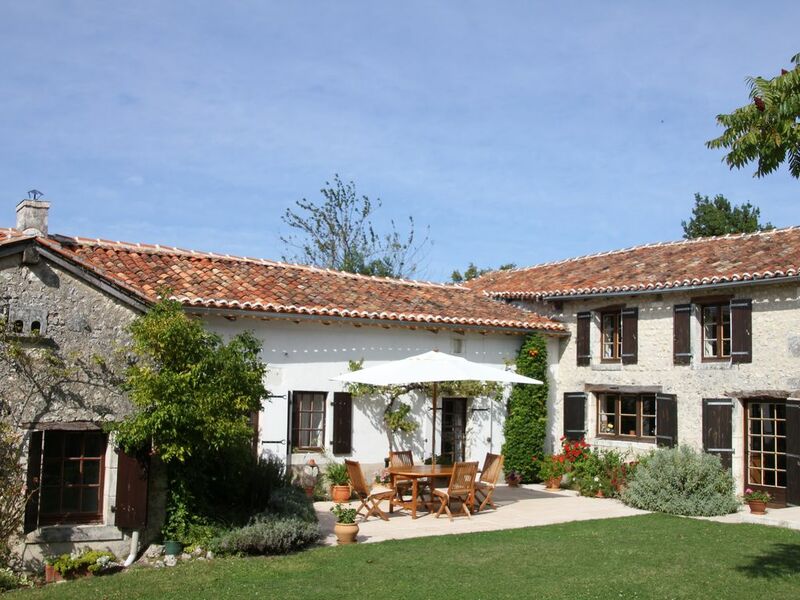 This is a five star property with a beautiful large garden,isolated amidst the fields. Totally safe, ideal for small children. We were there for a large family reunion (4 couples, 6 small children) and the facilities were perfect. You can't beat the view and especially the peaceful surroundings. We had planned several excursions but were so happy in the house that we mostly stayed there.Great contact with the owner.I warmly recommend the house for all wishing to spend a quiet holiday with family or friends away from it all! Our love affair with France was reignited by our wonderful two week stay at La Cotte in August. The serene setting, the comfort of the house, the luscious countryside and the timeless villages all contributed to our sense of well being. On top of that the sun shone brilliantly. Lazy days by the pool, evening BBQs in the secluded courtyard or sorties for an al fresco dinner in a nearby village all made the time fly by. The house was of the highest standard, both in equipment and comfort, and felt like a home from home. The pretty garden offered shade from the sun and beautiful views. All in all it was a fantastic holiday and La Cotte is a special property to be recommended to everyone. I have to say this is a very beautiful property at La Cotte. The property was very well maintained inside and out, cleanliness was perfection. As we are a large family of 10 we loved the spaciousness of the property. Patio area was large and pretty with beautiful surroundings. An added extra to this property was the swimming pool, this too is well maintained and supports a fenced off area all around. I would highly recommend this property to all my family and friends. We stayed end August / early September, for the third year in a row, with children and grandchildren, and other friends. The house is roomy and layout well-suited to multi-family use, and the grounds and pool are just fabulous - safe for youngsters, too, and there's always a shady or sunny spot to hide away with a book when you want to be lazy. As mentioned in another review, the mulberry tree and its produce are a bonus (be prepared to strip off to pick though! ), not to mention the plums, apples, grapes, brambles (blackberries to some of you) and herbs. This is an amazing house in beautiful and peaceful surroundings. For us we have found it to be ideal for both younger children - great pool, table tennis room, boules etc - and also older children - kayaking, mountain biking nearby. We have stayed at La Cotte 7 or 8 times since we first were lucky enough to find it about 15 years ago and would thoroughly recommend it. We have four children and have stayed with other relatives and friends each time and we have never had any problems whatsoever. The facilities are great and the property is well managed by a local English couple who are available if there are any problems. There are plenty of delightful towns and villages to visit nearby and markets to attend. I completely recommend this property and look forward to returning there soon. Tämä maalaistalo kiinteistö sijaitsee rauhallisella ja erittäin houkutteleva maaseutua puolivälissä välillä Angouleme ja Perigueux. Ajoajat Bordeaux ja Bergerac lentokentät ovat noin 80 minuuttia ja 70 minuuttia, vastaavasti. Ajo-aika Calaisista on noin seitsemän ja puoli tuntia (450 mailia). Muita aktiviteettejä: Golf, tennis, melonta (joen Dronne). Other than the June/September period, rates are by arrangement and booking periods need not run only from Saturday to Saturday. Although the house is large, it is very suitable even for just two people.